Despite losing in overtime to the Columbus Blue Jackets on Monday, the Boston Bruins have proven once again that they can compete with the best teams in the league regardless of who is in their lineup. 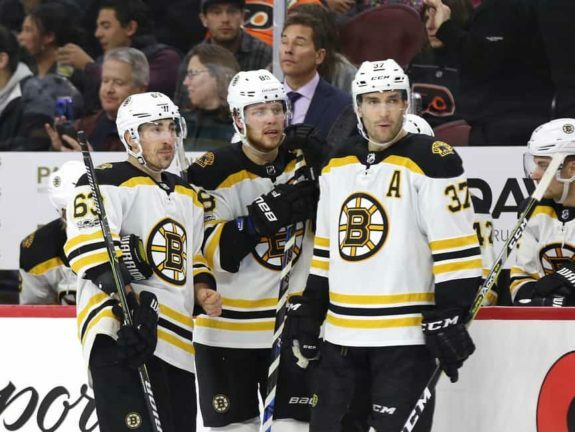 Entering the game without Patrice Bergeron, Jake DeBrusk, Charlie McAvoy, Zdeno Chara, Rick Nash and David Backes, the Bruins still found a way to score four goals against Columbus. Much of that offense was produced by newcomer Ryan Donato who had one of the best rookie debuts the NHL has seen in recent years. Recording a goal and two assists with six shots on goal in 19:40 of ice time, the Boston-native immediately looked at home on the team’s second line alongside David Krejci and Danton Heinen. It’s for that reason, then, that the Bruins will have some difficult decisions to make in the very near future. Who Plays & Who Sits When Bruins are Healthy? It isn’t the first time a question like this has been asked this season and it probably won’t be the last either. When the Bruins are fully healthy, who plays on which line in the postseason and who sits? With so many capable top-nine and even top-six forwards looking for ice time as well as top-six and top-four defenders, the Bruins will have to decide on a nightly basis who is best served in the lineup and where. It’s a job that nobody should be envious of but also one that head coach Bruce Cassidy has proven to be totally capable of handling since taking the reigns in Boston. A top-six like that would be arguably the best the Bruins have had in years. The top line can still be considered tops in the league and the second-line is reminiscent of years-past when Milan Lucic and Nathan Horton/Jarome Iginla found themselves flanking Krejci. Notably absent from that top-six, however, is Donato. Despite impressing with his first performance Monday, DeBrusk has done nothing to lose his spot alongside Krejci. In recent weeks, few players in Boston have looked as complete as DeBrusk in terms of skill, physicality and work-ethic. For that reason, DeBrusk should immediately slot back into his spot on the second line with Donato playing on the third line. When healthy, David Backes is a lock for the third line. A true leader and a capable top-six forward playing a third-line role is something most teams would be envious of. Fortunately for the Bruins, their team is so complete that they have the luxury of playing Backes so far down the lineup in a position that balances their team and allows the top six to rest more frequently. If Backes remains out for an extended period of time following the gruesome cut to his leg and Heinen turns things around in the interim, these projections could be subject to change. Assuming all things remain equal, however, this top-nine would be capable of competing with any other in the league, including the Nashville Predators and Winnipeg Jets. The fourth line will be the hardest to project for the Bruins moving forward. It would be hard to separate the group of Sean Kuraly, Tim Schaller and Noel Acciari given their chemistry and impact to the lineup this season. At the same time, it would be hard to sit Heinen, Brian Gionta and Tommy Wingels for an extended period of time. Such is a luxury and not so much a problem, however, as it’s simply impossible to have too much depth when searching for a Stanley Cup. The extra forwards in this scenario would be Gionta, Heinen and Wingels. While the lineup above should reflect the optimal lineup as of now for the Bruins, any of the extras can be slotted in without disturbing anything too drastically. Wingels versatility and ability to play on the wing or at center is an asset to the Bruins that shouldn’t be overlooked. 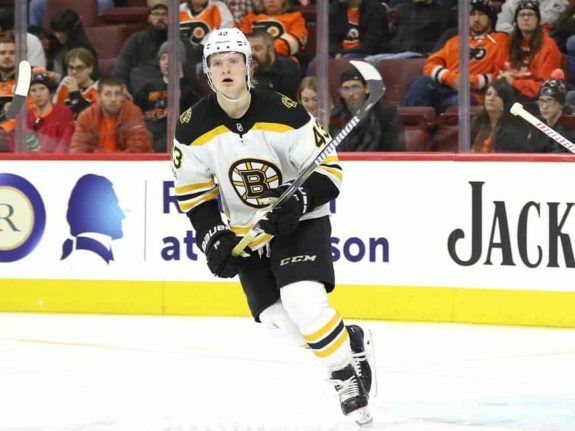 Similarly, Heinen’s ability to slot up and down the lineup at any forward position cannot be overstated – regardless of the slump he’s undergone in recent weeks. Nobody could have anticipated Gionta playing at such a high level after missing the entire season with Olympic aspirations. Still, the veteran forward has been an excellent addition to the locker room since signing his contract and his presence off the ice is just as important to the Bruins as his contributions on the ice. As the Bruins have seen more often than they’ve liked this season, anything can happen. It’s for that reason that the additions of Nash, Gionta, Wingels and Donato down the stretch were so important for the team with injuries rearing their ugly head once again. A long playoff run will almost guarantee more injuries and because of this, the Bruins being well prepared is something to appreciate. The lineup will likely change with each passing playoff game with Cassidy looking to find the perfect match each night. The lineup above, however, should be the team’s best bet to start things off regardless of who they’re matched up against.